a sort of belated welcome to 2013. Our season in the first Sunday of March, the first Sunday of National Tree Week, until the last Sunday of October. of the Tree Council Tree Week web pages. but they will be posted by the next weekend, I hope. and will be monitoring if the €4 car park charge there is offputting. Ogma's Tale Of The Trees book and audio suite. I do not have an Events Page posted for this yet but please put 3rd March at Lough Key down unless, and this is preferred, you would like to offer a gathering in another public access woodland anywhere in Ireland. as possible on 3rd March. Lets be in many woodlands then. Lets make our presence known through National Tree Week!!! 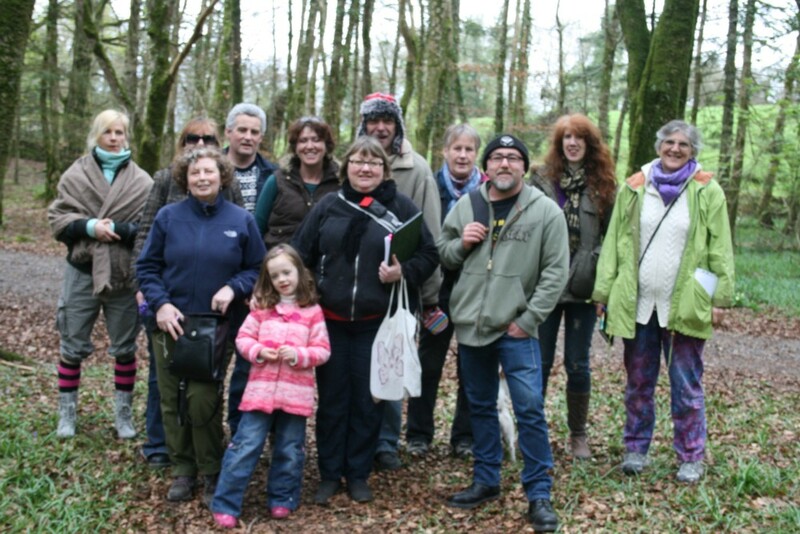 Gearóid Ó Branagáin is offering a gathering at Massy's Wood, Dublin Mountains plus time at the nearby Columcille Well. Again, please lets not make it just one event but lots of Bards In The Woods gatherings around Ireland listed in the Tree Week Events Calendar. Alone In The Woods or With Others? Through these winter months I have found that discussions about folks being in the woods more often has revealed that most people like to be in them alone. I find the extent of this very sad, and sometimes even quite selfish. It is common for folks to tell me the woods are their sanctuary and they have their "private" spots within the woods. I agree that being in the woods is an invaluable personal regenerator. We do need that. However, I also feel it is important to encourage spending time with others there in the woods too. Our Bards In The Woods serves as a wonderful gathering for expression, sharing and having a listening audience. Some folks do seem to have a fear of their egos being pricked at such events, and the fear of that can be quite a baggage for some people. And there is no charge, no fees exchanged. So much personal inspiration and growth could be deprived without sharing our inspirations and listening to others. Try out a little time with us one Sunday afternoon. If you are heading off to the woods with others on a Sunday also please let us know, if you would like to invite others along. The best place to announce your time in the woods is through our Facebook group. More activity for Bards In The Woods? I hope we will share more of our developing version of Shinrin Yoku. plus something close to this as well. There will be other explorations into Green Prescription within the woods. as relaxation and calm sharing is an essential prescription for us all too. Bards In The Woods Web Site? I am very slow as updating this as my attention has been on completing my Ogma's Tale of The Trees book and double cd audio set - but soon attention to the web site will be there. What is lacking is the source finder to good local food and I hope to update that as soon as possible. Most of the Public Access woodlands are there, but info is a bit out of date. and any offers you may have to keep people informed is welcome too. Bards In The Woods Publishing? all of a mix of some of your work that you will allow. helping others to get get Bards In The Woods going in other places and well expanded. Bards In The Woods Tree Planting. This has not been co-ordinated this winter, but lets hope our interest numbers raise and we can get a planting session going through next winter. Any questions about Bards In The Woods 2013? Please drop them in the comments below. Have bought house in Ballinamuck, so might organise one for the local woods there later in year. Its an eco restoration of the Robin Gill cottage. Wilk post more later. That would be great Tom. You have Derrycassan not far away, The beautiful beech wood of Mullaghmeen and the very pretty waterside Derrycarne.